Christians want to "do the right thing." But it can be tough to know what the right thing is. Plus, it's not just the big questions with which we must wrestle ethical dilemmas confront us each day in every aspect of life. On what basis do we make all of these decisions? 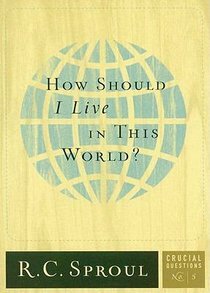 About "How Should I Live in This World? (#05 in Crucial Questions Series)"
Are people basically good? The philosopher Blaise Pascal called man "the supreme paradox" because compared to all other creatures, he is both the most magnificent and the most miserable. What did Pascal mean? The answer goes to the heart of what the Bible says about man. Man is created in the image of God, but the Bible also tells us that man has fallen into sin and become corrupt. In this booklet, Dr R C Sproul explores the nature of mankind by looking at what it means to be made in the image of God, as well as the nature and effects of the Fall.